TAIWAN FUN MAGAZINE, May 2007. A. Founded in 1988, Cold Stone Creamery uses Super Premium ice cream as the base for this relishing treat, letting customers exercise their creativity and choose their own combinations. As they say, there are as many as 12 million flavors you can create. B. Monkey Bites (left) is based with banana flavored ice cream. Very Berry Good is non-fat ice cream with blueberry, raspberry and strawberry flavors- which creates a sweet and sour fruity flavor. 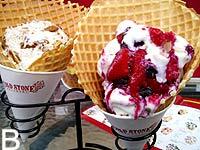 Cold Stone is a great 10-minute escape from your hectic day!